Mercure Hotel Munich City Centre. Book now! Free Wifi! Oscar Wilde said, "Travel enhesses the mind and cleans up with our prejudices." We look forward to your trip to us. 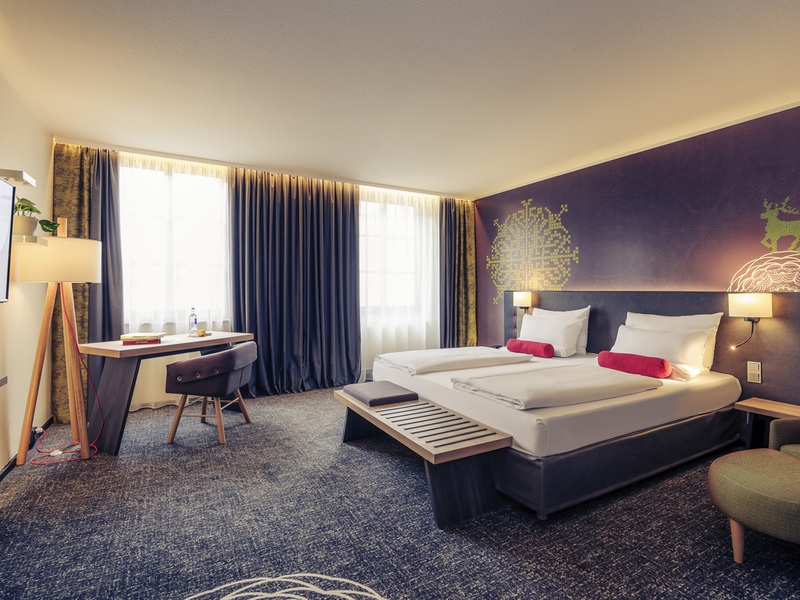 The Mercure Munich City Center was renovated in 2017 and is just a 3-minute walk from Munich Central Station. It offers air-conditioned rooms with free drinks from the minibar and a flat-screen TV, a beer garden and free Wi-Fi throughout. Our stylish rooms are decorated in Bavarian style and continue the feel-good atmosphere from our relaxation restaurant on the ground floor. The Mercure Hotel München City Center is particularly central. It is just 100m from the railway station of the Bavarian capital. The Munich Airport can be reached by S-Bahn in just under 45 minutes. Munich is one of the most inviting cities in the world: You will be captivated by its unique atmosphere as you stroll through the city streets. Visit Munich?s cultural treasures and enjoy a liter mug of beer in one of its many beer gardens. Young dynamic team, motivated to be hosts. Innovative restaurant concept "Relax," feel at home. Top location in the middle of Munich. Varied events such as gin tastings or Wine & Dine. No other 4-star house in Munich city centre has larger rooms: The Mercure Hotel München City Center offers standard, superior and privilege rooms and duplex suites. 167 rooms are air-conditioned and have free WIFI. A child up to 12 sleeps for free in the parents ' room. Your pet is welcome (fee 10 EUR/night). Feel at home in our Relax Restaurant. Enjoy delicious street food, quality wines from our winemakers, or one of local beers. We are particularly proud of our large Gin & Tonic selection. See for yourself! We have stayed for 2 periods of 4 nights and 2 nights respectively in early April 2019. The dining and housekeeping staff were friendly and efficient. I would have gladly given a score of 9 if not for ...... On both check-in, the Reception Desk was unmanned. The Reception Staff might have mistaken the meaning of &quot;efficiency&quot; as going thru the check-in process asap. Some of them were eager to dismiss us after allocating 3 rooms without giving adequate necessary info. We requested to book a larger taxi to the airport for 5 the day before our check-out, only to find out later that nothing had been done. One of us has hurt her legs the day before departure and I requested late check-out as Silver member but was rejected. However, thanks to Nino for efficiently booking the taxi and kindly helping us with the luggage! Can't fault the staff. It was a very busy time and they did everything to help us make it a pleasant stay! The restaurant was fully booked but as we were guests they made up a table just for us. Fantastic service. good experience at the bar/restaurant. the place has a warm atmosphere. the staff is friendly and welcoming. Room are confortable, design is cool. Generally I was very satisfied with the stay in your hotel. Except from upgrate for which I paid. It was guaranteed to have welcome gift/ sweets and water and the hotel didn't provide me in the room with guaranteed gift. Our room was up to your usual high standard although the key pad on the safe needed attention. On leaving at end of stay l was asked to pay for early book in. When in fact paid in advance. I felt member of staff was a little perplexed. Luckily l had my original booking with me. All staff friendly and helpful. Friendly service by all staffs - cosy atmosphere. Excellent room with space and nice bathroom. Close to train station and “Altstadt” – walking distance to number of spots for visiting. Breakfast buffet above average. The room was so spacios, so clean, so nice everything. I was so pleased to stay at this hotel. The staff was very nice, and the breakfast had everything you dreams of. I definitely recommend it, and if i go back i would stay in the same hotel for sure! Lovely large rooms. Good full breakfast but could be busy at peak times. Dont lie that room for 3 people, its good for 3 adult. Its not! Its for 2 adult and 1 child. Information does not true. No photos! Gorgeous spacious room, much needed at the tail end of my vacation, super helpful staff, yummy breakfast options, central location and best of all, I got a late check-out at no extra cost which was so helpful given my late evening flight. It was a fabulous find of a hotel and will definitely recommend to friends and family. An enjoyable overnight stay, spacious room, good facilities and near station.